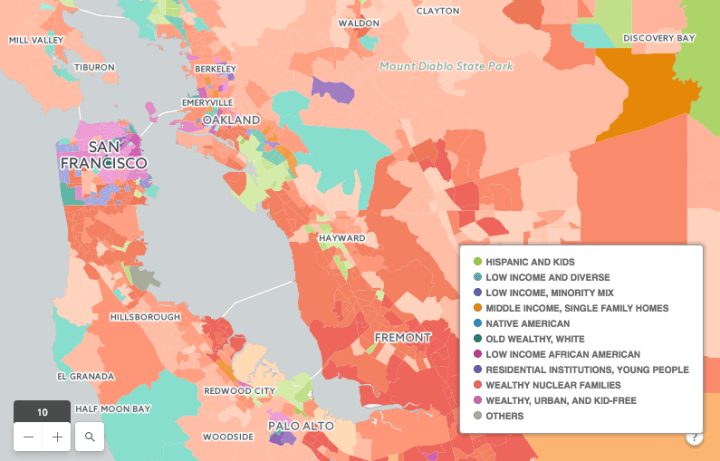 Alex Singleton and I have developed a “new” demographic atlas of the US. Its being distributed by CartoDB. 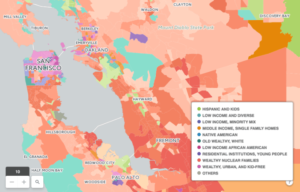 FlowingData story about my project w/ Alex Singleton on mapping communities with the American Community Survey. PORTLAND, Ore. — Tens of thousands of people along the U.S. Pacific Northwest coastline may not have enough time to evacuate low-lying areas before tsunami waves arrive, according to a new publication by researchers at the U.S. Geological Survey, University of Colorado Boulder, and California State University, Sacramento. The authors detail their findings in the scientific journal “Proceedings of the National Academy of Sciences.” They examined the 49 cities, seven tribal reservations, and 17 counties from northern California through northern Washington that are directly threatened by tsunami waves that could be generated by a future Cascadia subduction zone earthquake. The scientists evaluated the number of people or businesses exposed to tsunami hazards, as well as demographics and evacuation time by foot for each of these communities. In their analysis, scientists found that coastal communities fell into one of three groups differentiated by the size of their population and the time it would take to safely evacuate people. Communities in the first group have relatively small populations in tsunami hazard zones and likely have sufficient time to evacuate, suggesting the need for tsunami education. A second group of communities has large populations in tsunami-hazard zones and likely will have sufficient time to evacuate if people are able to move quickly, suggesting a need for evacuation training. The third group of communities has moderate-sized populations in tsunami hazard zones, but insufficient time for everyone to evacuate before wave arrival, suggesting the need for solutions such as vertical-evacuation refuges. The full study, “Community clusters of tsunami vulnerability in the U.S. Pacific Northwest,” is available online from the journal publisher. Big ideas about the study of cities and the environment? Computers, Environment and Urban Systems (CEUS) is an interdisciplinary journal that privileges the computational and geospatial perspectives on urban systems and the built and natural environments. CEUS is now accepting Review articles. Review articles are essays that consolidate progress and advance frontiers in the journal’s cognate fields. Review article can suggest new directions of research, consolidate advances across multiple fields, and/or critically evaluate themes (or methods) in the literature. The Editors of CEUS welcome inquires from prospective authors of reviews. The Editors of CEUS will also solicit reviews on specific topics, thus we welcome ideas for potential reviews from the broader academic community. Please contact Dr Seth E. Spielman for more information. In many countries data systems that have been in place for the better part of a century have started to change. Census data are still the major source for geographically detailed estimates of populations and economies. However, the national/state agencies that produce this data are increasingly under financial and political pressures to produce more accurate and more frequent estimates while survey response rates continue to decline and the cost of conducting surveys increases. In some countries there is strong demand to make better use of existing routinely collected administrative data such as medical, education, tax and welfare records for producing population estimates. The emergence of “big” data, such as social media, transactional databases and sensor systems, which are increasingly available in granular form, offers further potential opportunities to augment, refine, or supplement census data and reduce the costs of conducting a regular census. These pressures and opportunities present fundamental methodological challenges for both Census agencies and users of Census data worldwide. These challenges include: how to integrate data from the Census, different types of surveys such as “rolling surveys”, administrative data and big data to produce accurate population estimates at varying spatial and temporal scales; how to measure, communicate and visualise uncertainty in estimates from these mixed modes; how to design suitable collection and output geographies e.g. which aid survey design, minimise uncertainty and/or ensure statistical disclosure control. Can advances in computing technology, linkage of survey/census data and spatial big data be used to improve the collection, estimation and analysis of census estimates? Are there alternative spatial survey methodologies and/or conceptual frameworks that might yield improved small area estimates? How does one map (visualize) and/or detect change in period estimates? How does one visualize highly uncertain data? Does the inclusion of uncertainty in visualizations affect cognition and/or change the outcome of map-dependent tasks? Are there optimal ways to aggregate census geographies? If not, are there alternative ways to aggregate data that can preserve the social, economic, and spatial patterns of the data, while minimizing the risk of data hacking or statistical disclosure? Can geographic methods, such as dasymetric mapping and areal interpolation, improve the quality of census estimates? I was one three Professors on campus to receive the “Faculty Recognition Award” from the Boulder Faculty Assembly. Our data visualization work was profiled by the Atlantic Monthly’s CityLab. Alex Singleton and I just had a paper accepted into the Annals of the Association of American Geographers. The paper develops a novel strategy for dealing with the high margins of error in the census tract level estimates from the American Community Survey (ACS). For example, the ACS tells you really useful things like, “the number of children under 5 in poverty in Census Tract 203 in Autauga County, Alabama is 139 children +/- 178”. Implying that number of poor children in the tract is somewhere between 0 and 317. This isn’t a unique case, in the 2007-2011 ACS release 72% of all census tracts in the US have margins of error greater than the estimate of children under 5 in poverty. In most places, the best you can learn from the ACS is that somewhere between 0 and X kids live in poverty. I was awarded the Michael Breheny Prize from Environment and Planning B, one the leading urban analytics journals. The winning paper uses a simulation model and really cool experimental design to study the association between urban environments and behavior.